A question that arises with some of Ken Edwards' other books too --- what are we going to call it? 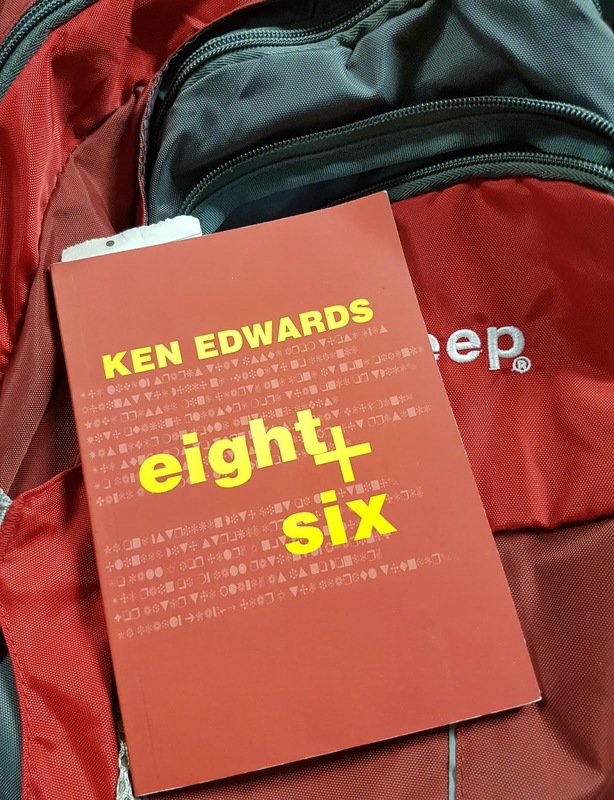 eight + six was published in 2003 (by Ken's own Reality Street Editions). It's a small format paperback, an ideal form for carrying around in a backpack or back pocket for all-through-the-day dipping. Each page has a sonnet on it. It strikes me as somewhat strange that the "plus sign" doesn't slope when you're in an italic font. Why is that? So personally I prefer to call it "eight plus six", but even this isn't really satisfactory because it prompts me to a sort of kneejerk addition sum. So far as the sonnet formats are concerned, the division into 8 and 6 is normal but it isn't quite invariable. For example, "Shifts Genre Often" has no division and "Perturbations (2)" is divided 3-4-4-3. Nice! More relevantly, very few of these sonnets have a traditional sonnet feel to them. But occasionally, one of them does. You end up thinking about the form... working it out. What's the feel here? What does it sound like? The formal energy of these poems is important. I think it's to do with the author being a bass guitarist. The distinctive feel, look, and sound of each poem is a big part of its meaning. But only a part. what is this piece of wood doing in my hands? * For Chris Shurety, on his 50th birthday. Chris Shurety, composer and director of COMA (Contemporary Music for All). A few poems in eight + six , it occurs to me, might have inspired Peter Hughes when he was writing Quite Frankly: After Petrarch's Sonnets. Here --- sometimes -- is love poetry, demotic settings and idioms, the hint of a rap-like comic delivery: the Hughes sonnet starts to come into focus. * For Michael Finnissy, on his 50th birthday, July 1996. † The phrase is from Rilke's letters. "Absconsion" is the rare noun from "abscond"; it means flight, refuge or self-concealment from authority. Ken's spelling perhaps develops this action into a habitual state of consciousness. Good to see the dagger (aka obelisk) footnote symbol, insufficiently used in most modern texts!